The New Jersey Legislature was established in 1702 upon the surrender by the Proprietors of East Jersey and those of West Jersey of the right of government to Queen Anne. Anne's government united the two colonies as the Province of New Jersey, a royal colony, establishing a new system of government. On December 6, 1775, Governor William Franklin prorogued the New Jersey Legislature until January 3, 1776, but it never met again. On May 30, 1776, Franklin attempted to convene the legislature, but was met instead with an order by the New Jersey Provincial Congress for his arrest. On July 2, 1776, the Provincial Congress approved a new constitution which ordered new elections; on August 13 an entire new legislature was elected. In 1775, representatives from New Jersey's 13 counties established a Provincial Congress to supersede the Royal Governor. The New Jersey Constitution of 1844 provided for a direct popular election of the governor, and gave him the power to veto bills passed by the Legislature. The General Assembly was expanded to 60 members, elected annually and apportioned to the counties based on population. Regardless of any changes, the Legislature met infrequently, had high turnover among its members, and was far from being the most influential or powerful organ of state government. New Jersey adopted its current constitution in 1947. Under this constitution, the governor was given additional veto powers and the ability to serve two terms. Hundreds of independent agencies were consolidated into 20 principal executive departments under the control of the governor. Senators' terms were extended to four years; assemblymen's terms to two years. In 1966, the Senate was expanded from 21 to 40 members and the General Assembly from 60 to 80. Following a United States Supreme Court decision in 1964 and a New Jersey Supreme Court decision in 1972, the state's legislative districts were reapportioned into the current arrangement. Two more modern developments have also helped shape the Legislature: the increase in importance of legislative committees and the development of longer tenures for the legislative leadership. 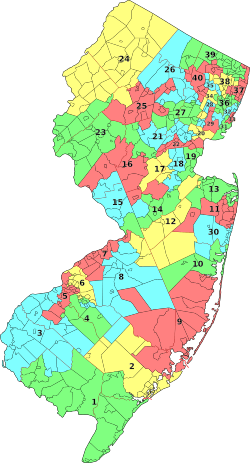 New Jersey Legislative Districts as of the 2011 redistricting. The Legislature has the power to enact laws by a majority vote of both houses, subject to the Governor of New Jersey's ability to veto a bill. A veto may be overridden by the Legislature if there is a two-thirds majority in favor of overriding in each House. By a three-fifths vote of each house, the Legislature may propose an amendment to the State Constitution. Alternatively, it may propose an amendment by a majority vote two consecutive years. The Senate has the sole authority to confirm or reject gubernatorial nominees for judicial and some executive positions. The current organization of the Legislature is outlined by Article IV ("Legislative") of the New Jersey State Constitution of 1947.To become a member of the Assembly, an individual must be at least 21 years old, must have resided in their district for one year and the state for two years, and must live in the represented district. To become a Senator, an individual must be 30 years old, must have lived in their district for two years and the state for four years, and again must live in the represented district. The sitting Legislature is the 215th Legislature of the State of New Jersey. Currently, the Democrats are the majority party in both Houses. In the Senate there are 24 Democrats and 16 Republicans. There are 48 Democrats and 32 Republicans serving in the General Assembly. The senate is the upper house in the New Jersey legislature. Currently, 40 people serve in the Senate for two years after redistricting, followed by four-year terms. 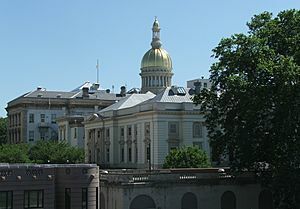 The general assembly is the lower house of the New Jersey legislature. Currently, 80 people are in the New Jersey legislature for two-year terms. 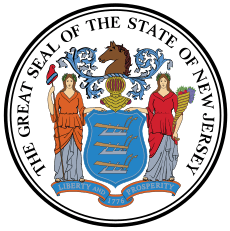 New Jersey Legislature Facts for Kids. Kiddle Encyclopedia.